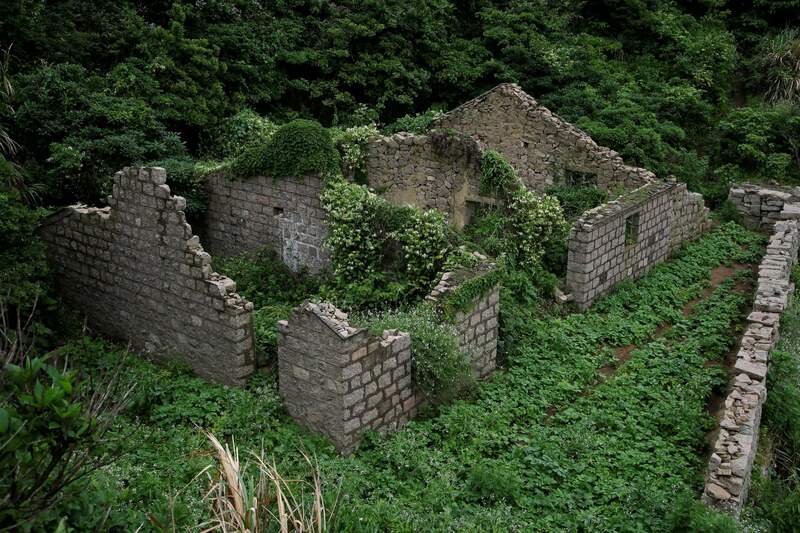 Buildings are covered in ivy in the abandoned fishing village of Houtouwan on the remote island of Shengshan, about 50 miles off the coast of Shanghai. The “ghost village” draws visitors down perilous footpaths winding past structures worn down by roots, rain, vines and wind. 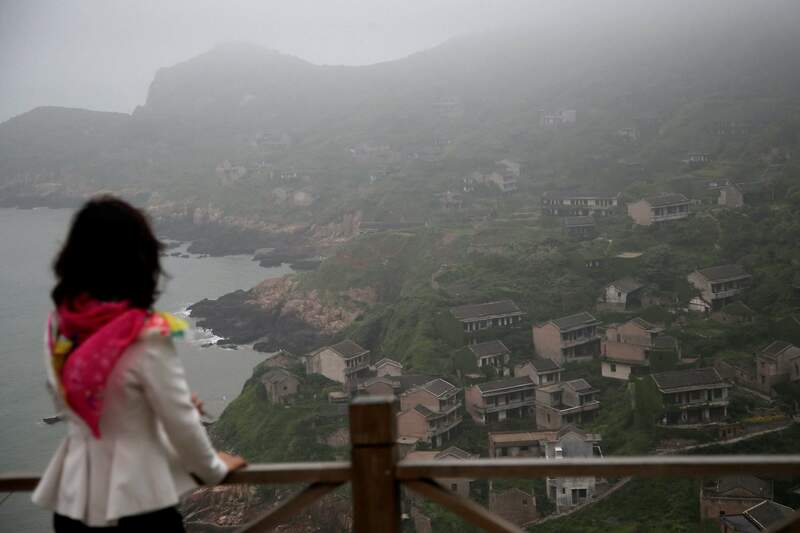 A tourist stares at mists blanketing the abandoned fishing village of Houtouwan on the remote island of Shengshan off the coast of Shanghai. Ruins of a building in the abandoned fishing village of Houtouwan on the remote island of Shengshan, about 50 off the coast of Shanghai. 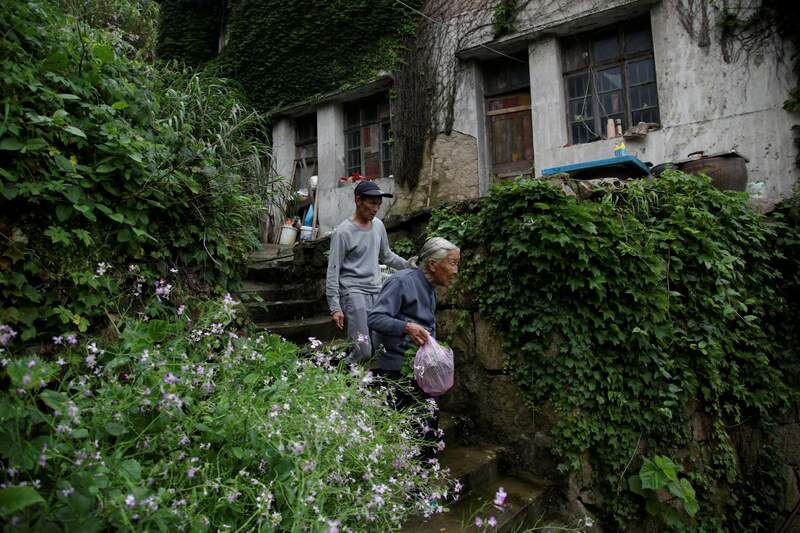 Lin Fazhen, 60, left, leaves his home with a neighbor in the former fishing village of Houtouwan. The pair are two of the five residents left from the 3,000 that once lived in the village. 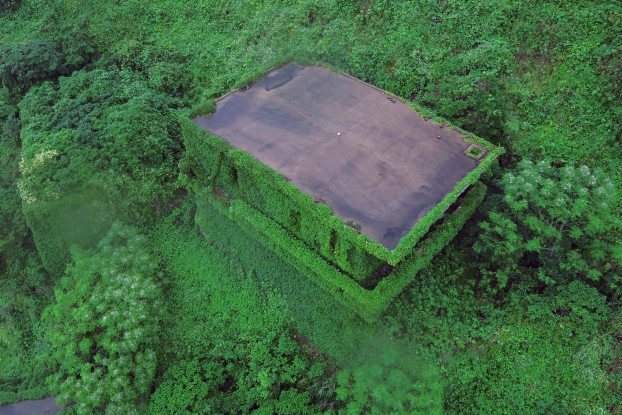 A building is covered in ivy in the abandoned fishing village of Houtouwan on the remote island of Shengshan, about 50 miles off the coast of Shanghai. Ruins of a building in the abandoned fishing village of Houtouwan on the remote island of Shengshan, about 50 miles off the coast of Shanghai. 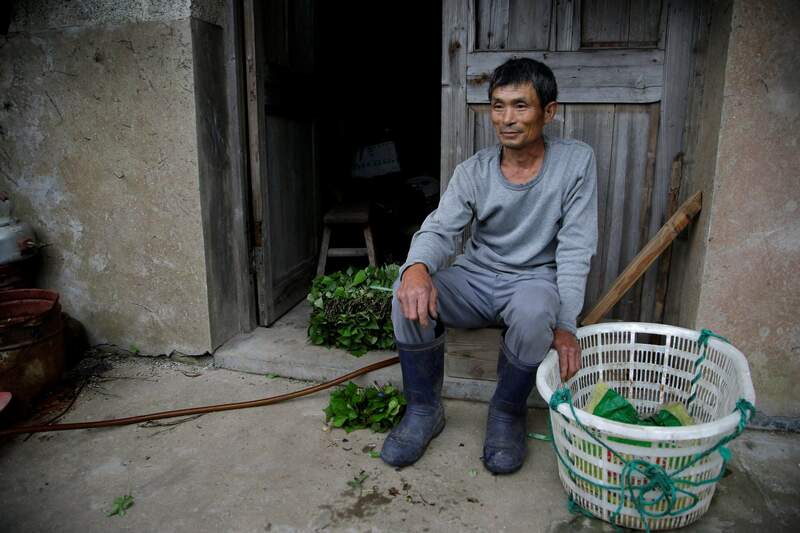 Lin Fazhen, 60, sits outside his home in the former fishing village of Houtouwan. He is one of the five residents left from the 3,000 that once lived in the village. 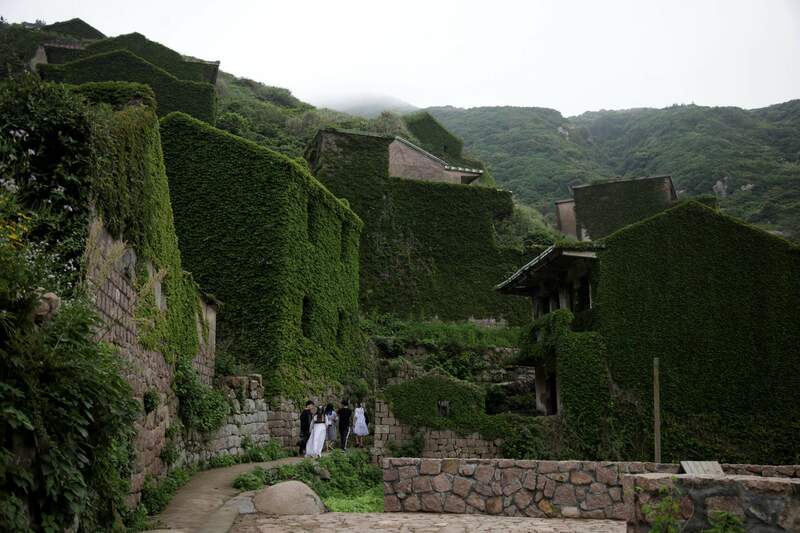 Tourists walk up narrow stairs winding through the abandoned fishing village of Houtouwan on the remote island of Shengshan. 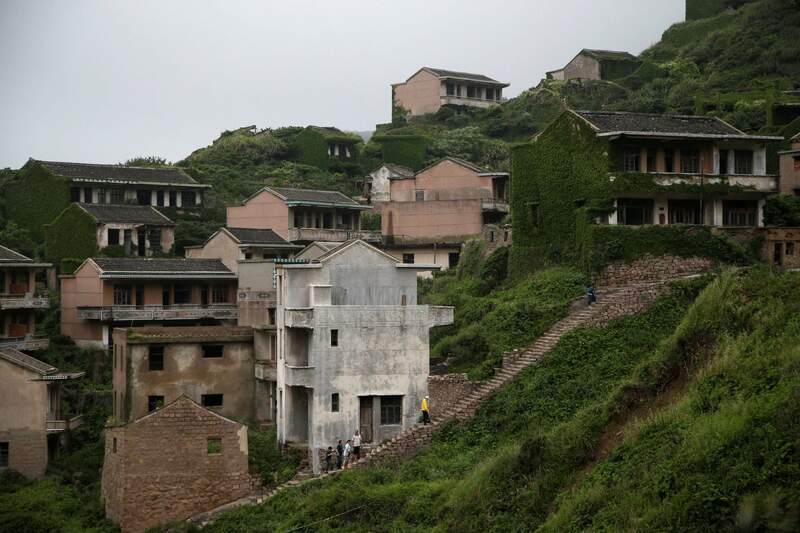 Only 5 of the 3,000 residents remain in what some call a “ghost village” that draws visitors down perilous footpaths winding past structures worn down by roots, rain, vines and wind. Huang Dan, 22, while on a visit to the abandoned fishing village of Houtouwan on the remote island of Shengshan. She enjoys photographing the beauty of human structures subsumed by roots, rain, vines and wind. “It feels like this place belonged to nature from the very beginning, and the old invaders finally left, and nature finally made it back,” she said. Tourists pass by a sign which reads “Houtouwan” leading to the former fishing village of Houtouwan on the remote island of Shengshan, off the coast of Shanghai. 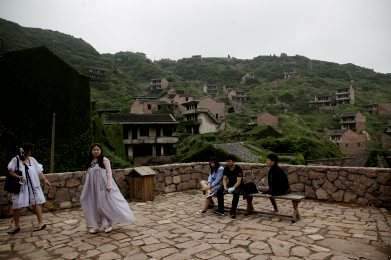 Only 5 of the 3,000 residents remain in what some call a “ghost village” that draws visitors down perilous footpaths winding past structures worn down by roots, rain, vines and wind. Tourists rest inside the abandoned fishing village of Houtouwan on the remote island of Shengshan, off the coast of Shanghai. 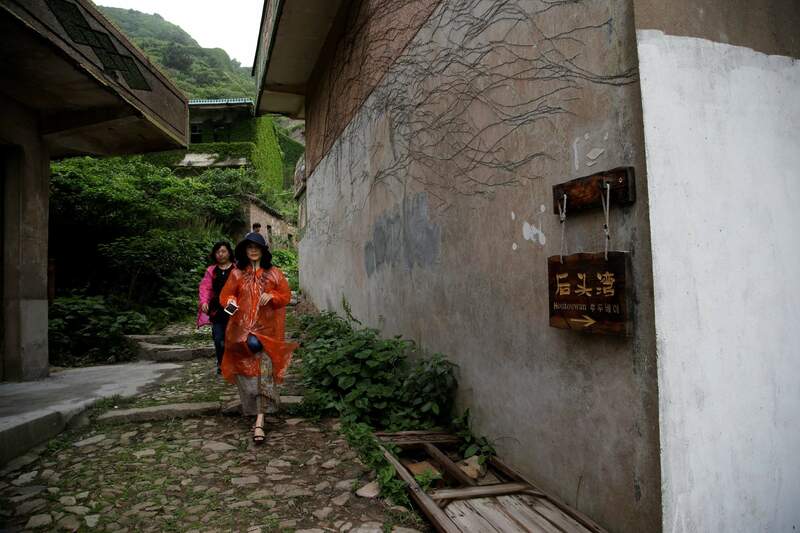 Tourists walk next to an abandoned building in the former fishing village of Houtouwan on the remote island of Shengshan, off the coast of Shanghai. 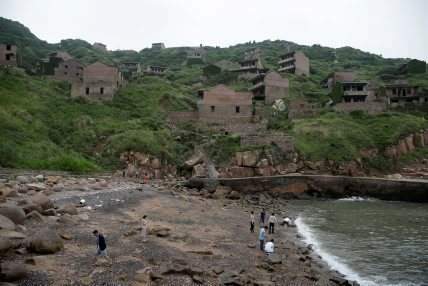 Tourists play at the beach next to abandoned buildings in the former fishing village of Houtouwan on the remote island of Shengshan, off the coast of Shanghai. 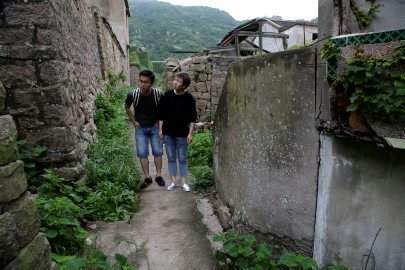 Zhu Mandi, 50, right, and her son, Wang Yi, 27, carefully walk through the former fishing village of Houtouwan to find the home their family abandoned in 1995. 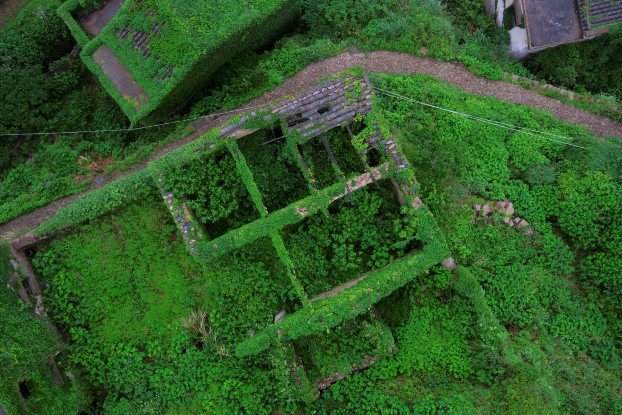 A building is covered in ivy in the abandoned fishing village of Houtouwan on the remote island of Shengshan, 9off the coast of Shanghai. 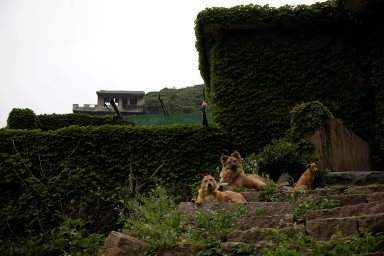 Dogs rest on stone steps in the abandoned fishing village of Houtouwan on the remote island of Shengshan. 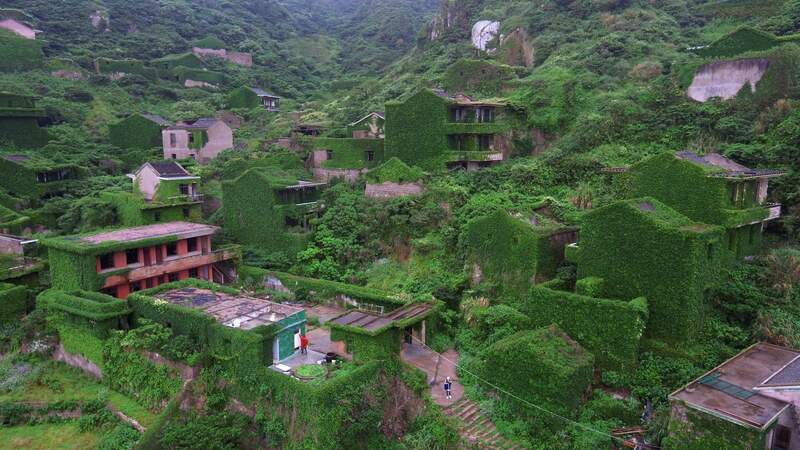 HOUTOUWAN, China – Blanketed with greenery, the ghost town is perched atop cliffs looking west into sea mists obscuring the horizon. Abandoned homes ravaged by weather and creeping vines stand silent but for the surf, the whine of mosquitoes and birdsong. 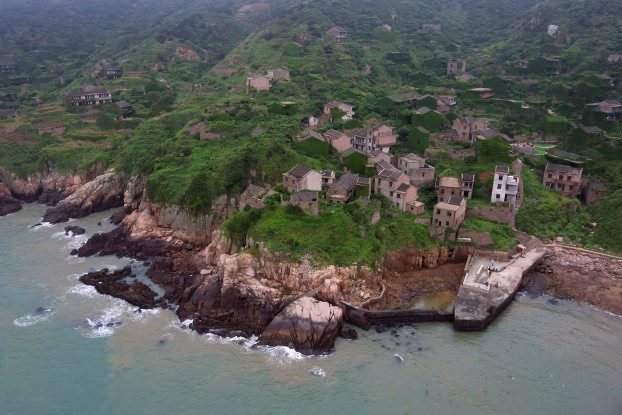 This is Houtouwan – “Back Bay” in Mandarin – an abandoned fishing village engulfed by nature on the far eastern island of Shengshan, about 50 miles off the coast of Shanghai. Small groups of tourists on a recent weekend braved muddy footpaths through overgrown lawns to chase foggy photographs and answers to the question: What happened to the village? The story of the Wang family may provide one answer. Wang Yi left the village at the age of 5, when his family moved to the island’s main town to access its better services. When he returns to Houtouwan, the 27-year-old college graduate gathers honeysuckles for a fragrant tea that reminds him of his birthplace. Memories of village festivals draw infectious laughter from his mother, Zhu Mandi, who still dreams about her childhood among the mist-shrouded mountains next to the sea. “I dream of playing here, and it looked like it did when we played here when I was young,” Zhu said, pointing at her former family home. Vines have since wound through the three-story house, and ivy has crept through the now broken wooden front door. The island draws tourists from the mainland intrigued by the village’s unique devastation. Ivy cloaks some buildings completely, but on many Houtouwan houses, beautiful roof tiles still gleam and broken verandas offer majestic views of the stormy sea. 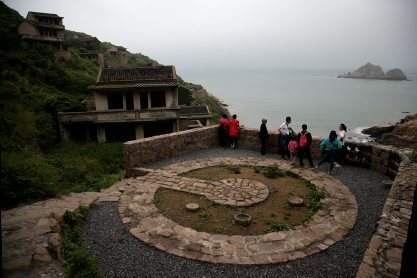 Visitors must take a boat to Shengshan then a taxi up a hill to a cemetery overlooking the village, and then descend down perilous footpaths into the mist and ivy. 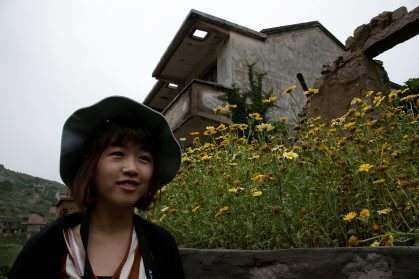 Huang Dan, a 22-year-old student, was among the visitors on a recent weekend who said she wanted to photograph the beauty of human structures subsumed by roots, rain, vines and wind. “It feels like this place belonged to nature from the very beginning, and the old invaders finally left, and nature finally made it back,” she said. The village isn’t entirely abandoned. Five people still reside here with a relaxed pack of dogs that roam the empty homes. Sun Ayue lives in a small home just off the main path through the old village. The 62-year-old former fisherman remembers the village’s boom times – and the bust. China is the world’s largest fishing nation. But poor enforcement of fishing regulations has led to a rapid decline in fish stocks. Wang Yi, the college graduate, said fishermen returned from the sea with emptier and emptier nets before China imposed seasonal moratoriums on fishing operations in the late 1990s to protect fish stocks from further depletion. Yet Sun says most of the village’s 600 families ultimately left Houtouwan because it lacked proper roads and a school. “Transportation was inconvenient,” he said, making it difficult for teachers to get to Houtouwan from the main town Shengshan. “It was too far away. They arrived in the dark and left in the dark,” he said. Houtouwan is “a microcosm of the entire Chinese society,” said Zhao Yeqin, an associate sociology professor at the East China Normal University in Shanghai. The village reflects a broader migration trend that has seen countless Chinese move from rural areas to urban megacities like Shanghai, Shenzhen and Guangzhou. When the people left, he began planting cauliflower, cabbage, lettuce, celery and basil. He says he now farms about a third of an acre of various plots scattered across abandoned lawns, gardens and terraces. He chuckled when asked if the village was haunted. “People got scared and said ghosts were living here, so it was called ghost village,” Lin said.